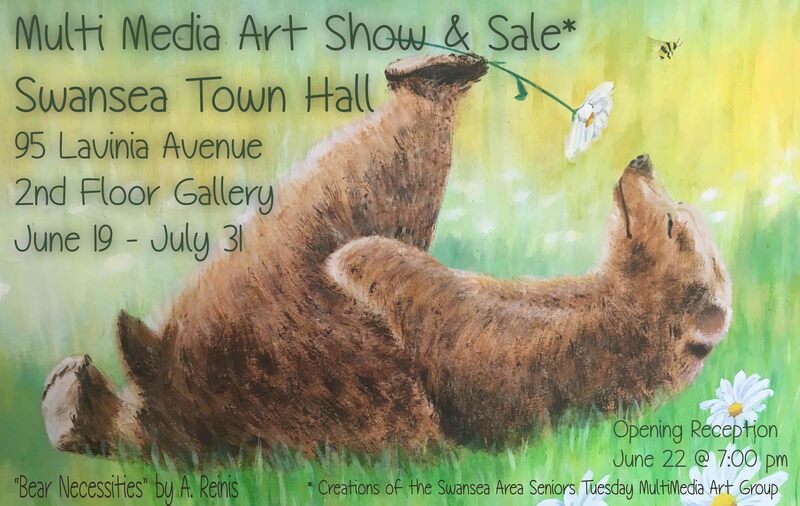 The Swansea Senior’s MultiMedia Art Class have been meeting for the last 20 years or so every Tuesday at 9:30 a.m. We congregate in the Evergreen Room in the Town Hall to draw, sketch and create. Every year we like to display all our creative work from the previous year. We work in a variety of mediums from acrylic to watercolour, and workshops are taught by instructor Bernadette Hunt. There is a healthy mix of novice and seasoned painters and we are an engaging and sometimes boisterous group who welcome any and all newcomers. Until July 31st, we will be showcasing our work in the 2nd Floor Lobby! Drop by to see the show any time during the Town Hall’s opening hours. Some of the pictures will be on sale during the show, so come buy something for yourself or a gift for an art loving friend. Enquire at the front desk or phone SASA (416.392.1953) for more details.